Reuben's Brews - Beer Unbound - T-SHIRT DESIGN WINNER ANNOUNCED! Earlier this year, we asked you to send us your designs for our first-ever t-shirt design contest and you didn’t disappoint. We were really impressed with everyone’s talent and creativity! The Reuben’s team reviewed and voted on the entries and we’re pleased to announce our winner – Danny Haymond, Jr. of Tacoma! Danny’s a graphic designer by trade and a big Star Wars fan. 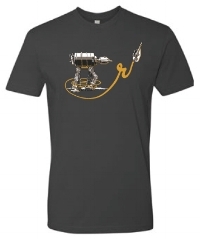 Since we’re releasing the t-shirt today, May 4, incorporating some element of “the Force” only seemed appropriate. We printed Danny’s design on charcoal grey t-shirts, which are available exclusively in the taproom while supplies last. We are donating $2 to the charity of Danny's choice, which is the King County Sexual Assault Resource Center. Congratulations to Danny and a huge thank you to everyone who entered!